Extra-Virgin Olive Oil contains a component that could reduce post-prandial blood sugar levels. This results from a study conducted by a research team of the Sapienza University led by Francesco Violi, published in the British Journal Clinical Pharmacology, which could pave the way to new perspectives for the treatment of diabetes. 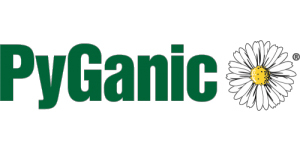 Sumitomo is currently reviewing PyGanic® Organic Insecticide, a pyrethrum based control for insect pests. Currently olive growers are authorised by APVMA to use PyGanic® for the control of Olive Lace Bug (OLB) using the AOA Permit http://permits.apvma.gov.au/PER81870.PDF. Please send your responses ASAP to AOA Agri-Chemicals Committee Co-ordinator Peter McFarlane at peter@mc.com.au. Have you completed the national IPDM Survey? All olive growers should now have received an invitation to participate in the national Industry Pest & Disease Management (IPDM) Survey. An integral element of the levy-funded R&D industry IPDM project, the survey will produce important information that will guide the scope and activities of the project, including information to be provided in the upcoming national IPDM Field Day program. Participation is anonymous, with all data aggregated to provide a comprehensive overview the industry’s current status and needs in relation to IPDM. Anyone needing clarification, or requiring further information, can contact project lead Dr Robert Spooner-Hart via r.spooner-hart@westernsydney.edu.au or 02 45701429. And if you haven’t received your survey invitation and would like to participate, you can do so here or email secretariat@australianolives.com.au with the subject line ‘IPDM Survey’. This is an important industry project with significant immediate and long-term benefits for all, so all Australian growers are urged to complete the survey as soon as possible. From 1 July 2018, foods must be labelled according to the requirements of the Country of Origin Food Labelling (COOL) Information Standard 2016. EVOO and table olives are required to adopt the new COOL labels, so make sure you’ve for your labels updated and compliant in the next three weeks. More information here. Employing backpackers? Registered for the backpacker tax? The new 15% “Backpacker Tax” arrangement requires employers to register with the Australian Taxation Office (ATO) if they employ, or plan to employ, workers who hold either a Working Holiday Visa (subclass 417) or Work and Holiday Visa (subclass 462). You need to register before making the first payment to them and withhold tax at 15% for the first $37,000 earned, or use foreign resident tax rates for income earned over $37,000. If you don't register, you must withhold tax at 32.5% up to $87,000/foreign resident tax rates over $87,000. Download and complete the application form here, and access tax tables for Working Holiday Makers here. The Seasonal Work Incentives Trial (SWIT) aims to encourage people to take up short term seasonal work opportunities in the horticultural industry by providing them with an opportunity to earn more without affecting their income support payment. The Trial is being managed by jobactive providers who work closely with growers and participants to ensure the perfect ‘fit’. To participate in the trial, contact an employment services provider to discuss your labour needs. You can find details of those in your region here. Olives SA has once again paired with WEA and celebrity chef Rosa Matto for a consumer-friendly presentation on cooking with olives and olive oil. The session commence with a segment highlighting the qualities of table olives and olive oil, followed by a range of dishes showcasing their versatility. Details: Sunday, 24 June at 11am, WEA Centre, Adelaide. More information and bookings here. Krowera Olive Grove is a gold-medal winning EVOO grove in South Gippsland, located 1.5 hours south east of Melbourne. Address is 27 Uren Rd, Kongwak 3945 (Google Maps). There is currently a bumper crop, but due to personal circumstances, we are unable to pick this year. Estimated crop size is about 20 tons, or around 2-3000 litres. Mainly Frantoio and Leccino. We are looking to sell off the tree, or organise an arrangement to keep a small quantity of oil, in lieu of payment. Olives are beginning to blush, so picking would be ideal now and for the next 2-3 weeks. Nets, boxes etc are available. 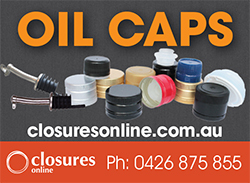 Please contact David Ehrlich - 0419566966 or david.ehrlich@bigpond.com for further details. Details of the first events on the schedule of AOA National Integrated Pest & Disease Management (IPDM) program have been released, kicking off with three Field Day/Workshops across New South Wales. Registration for the full-day Rylstone Field Day/IPDM Workshop opens next week and a notice with full details will be emailed to all growers. Numbers are limited to 40 per event, so reserve your place quickly! Olives New Zealand has advised of MPI approval of the application for growers who package their own EVOO to register under National Programme 1 (NP1), rather than National Programme 3 (NP3). NP1 registration requires a one-time verification visit, rather than every two or three years under NP3. 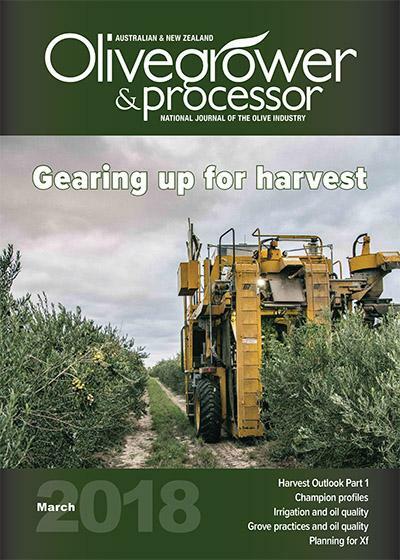 The exemption applies only to olive growers registered under NP1 for horticultural activities, who are also registered users of the OliveMark™, and who follow the procedures in the Olives NZ National Programme Template manual. Other stipulations also apply and growers must use the Olives NZ National Programme Template ($250+GST). NP1 and NP3 Templates are also available: please contact the Executive Officer via admin@olivesnz.org.nz to purchase or update your documents. The approval is now in the final stage of being added to the Section 33 Exemption document, which can be found here. Morrisons has unveiled olives infused with gin just in time for summer. The unusual treat will likely prove popular with shoppers looking to bring something a little different to their next picnic or barbecue. Editor’s pick … gin + olives = heaven! 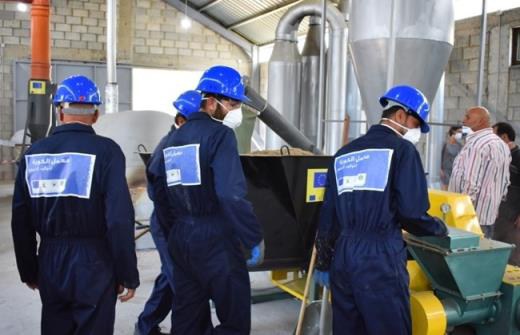 The safety masks handed out didn’t entirely conceal the smell of burning wood, as visitors stepped into the newly inaugurated factory in Koura’s Kfar Hazir, which turns tree clippings into briquettes to be used as firewood. Wagyu beef produced from olive-fed cattle on a remote island in Japan’s Seto Inland Sea is experiencing exponential demand at home and abroad, thanks to its healthy fats and ‘umami’ (savoury) flavour. Olive feed beef is really gaining momentum, and big money! Australia and New Zealand both have olive waste and cows – is it time to phone a cattle farming friend for some value-adding? 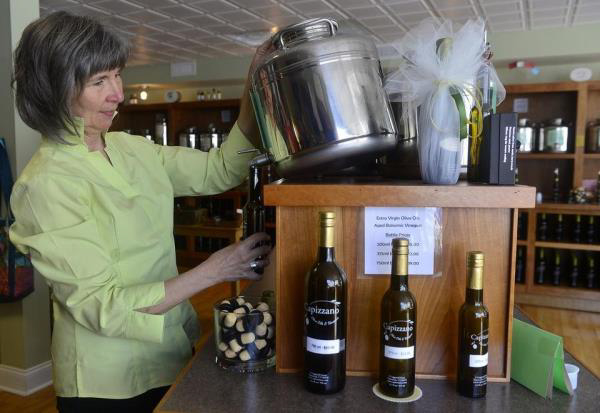 Suzanne Capizzano pours a bottle of olive oil for a customer at Capizzano's Olive Oils & Vinegars in Pawcatuck. (Sarah Gordon/The Day). Stephen Capizzano has an emotional attachment to olive oil. Growing up in Westerly he remembers his late father, Angelo, cutting the innards out of cherry peppers, blanching them, then stuffing them with cheese and packing them in jars with olive oil. 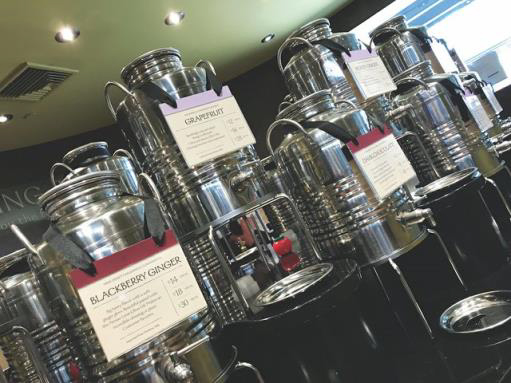 “Everything began with olive oil, whether it was a meal or canning,” says Capizzano, co-owner with wife Suzanne of Capizzano Olive Oils & Vinegars in Pawcatuck, on the doorstep of Westerly. Retail dedication to quality EVOO and consumer education … hope this trend keeps growing! Olive oil was one of the food products in focus here. There’s olive oil, and then there’s olive oil, and Josh Saiia is eager to explain the difference. As the owner of ORO di Oliva, which specializes in fresh extra virgin olive oil and aged balsamic vinegars, Saiia and his staff at their four retail locations (Wauwatosa, Whitefish Bay, Brookfield and Milwaukee Public Market) encourage sampling, suggest pairings and answer questions. More of that dedication and commitment to consumer education … the momentum’s building!